We are thrilled to announce that one of our trade show exhibits has won “Best of Show – Exhibits 200 sq. ft and Under” at the American Association for Respiratory Care’s (AARC) 2017 International Respiratory Congress. Our client, Aerogen, is the world’s leading manufacturer and distributor of higher-performance aerosol drug delivery technologies. 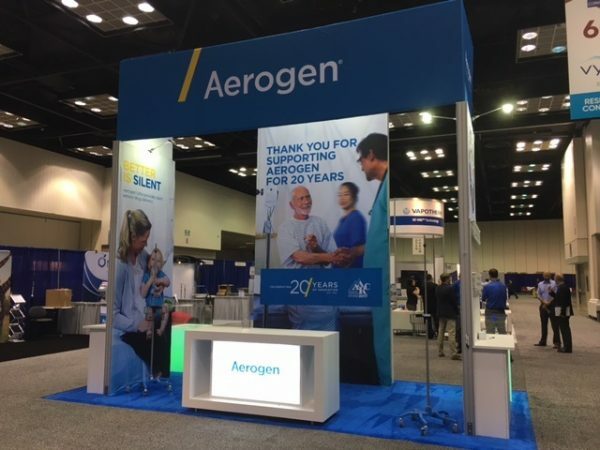 The “Best of Show” exhibit consisted of a 10’ x 20’ island that featured five interactive activities designed to attract Congress attendees while encouraging them to share their experiences with Aerogen products. The bold graphics and creative textures stimulated engagement between visitors and booth staff.